Bioinformatics is a melting pot in the world of science. As a study of analyzing complex data, it’s not a field for everyone, but its applications are vast. 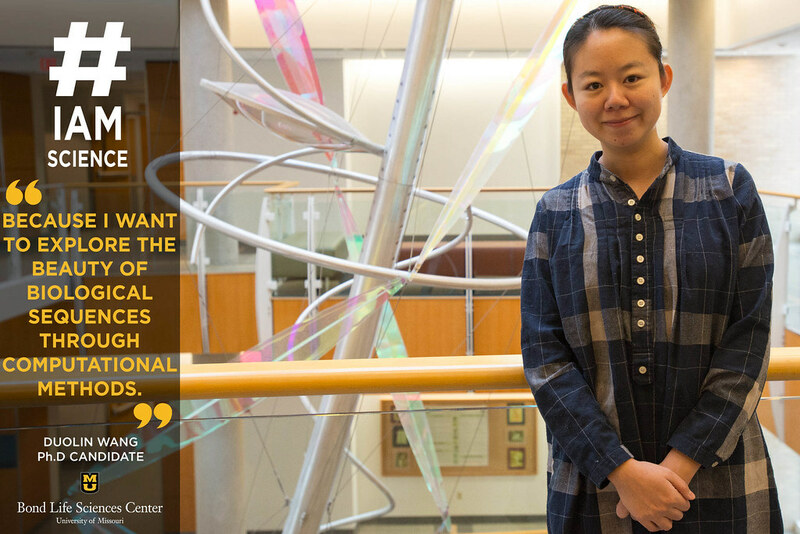 Duolin Wang, a researcher in the Dong Xu Lab at Bond LSC, isn’t intimidated by the complexities her field presents. She came to America from China to conduct research for Xu’s lab while she simultaneously works on her thesis to earn her Ph.D. from Jilin University in China. Wang and her lab practice deep learning, which is a state-of-the-art approach to machine learning. Essentially, deep learning is a way to better understand the complex data that the bioinformatics field covers. For instance, it turns terabytes of information on a sequence to help researchers predict how best to improve its effectiveness. She didn’t just stumble into her research position, though. Her supervisor at her university in China had collaborated with Xu in the past. When Xu traveled overseas, Wang was able to meet him in person. “I showed my interest in his research, and I asked him if I could come to the United States to continue my research,” Wang said. The rest is history. In the three years she’s been at Mizzou, Wang has been able to work on a number of projects in her field. That’s largely thanks to Xu’s flexibility with the topics she focuses on. Wang has even written a few papers, including one for Monsanto thanks to the help of Juexin Wang who also works in the Xu lab. That experience has helped her to prepare for a future in research writing proposals. It’s not all about the work, though. Wang is on track to finish her Ph.D. this summer, but she’d like to continue what she’s been doing at Bond LSC. For researchers, the shape of molecules gives insight into how cells, viruses and other macromolecular interactions take place. Getting a clear view of that structure is the hard part, and the new Molecular Interactions Core (MIC) at the Bond Life Sciences Center will now give researchers from many different disciplines one place where state-of-the-art equipment are available for them to use to further science. Dr. Kamal Singh is excited that goal is being realized. One of the 10 MU’s core facilities that serve scientists’ needs, the MIC specifically provides training, advising and shared equipment for researchers to take a closer look at molecules. That’s where Dr. Singh comes in. He serves as the Assistant Director of the MIC and oversees the day-to-day operations of the facility. Dr. Singh makes sure the machines are operational, communicates with researchers interested in using the facility, trains those who do not yet know how to use the equipment and gives guidance as well as collaborative feedback on things like computer-assisted drug design — his specialty. The humming of machines is the first thing noticed when walking into the MIC. These instruments allow you to look at 3-dimensional models of the molecules like HIV enzymes or view protein crystals under a microscope before diffracting light through them. It’s a lab where miniscule pieces of life become big and important. Dr. Mark McIntosh, the vice chancellor of research for all UM system campuses, had the idea to create the MIC. “It was Dr. McIntosh’s vision to bring everything together; which includes structural biology, molecular interactions, particle size, zeta potential, mass of the nanoparticles, etc. He also wanted to bring peptide synthesis here to have everything at one central location,” Dr. Singh said. Understanding structure at the molecular level helps scientists figure out how reactions happen, how molecules fit together and serve as signals and how pathogens can invade cells, among other possibilities. 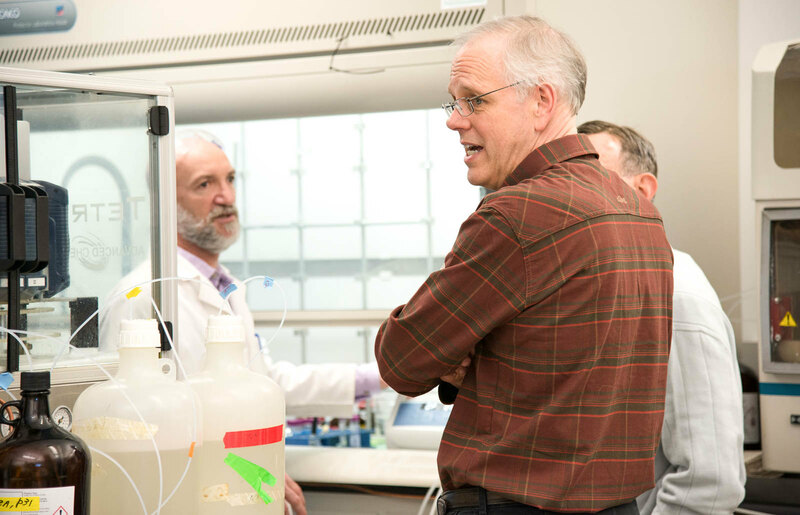 “I’m hoping that we can really facilitate structural and molecular research on campus — structural determination and molecular interactions — and really push boundaries of the current state of the field,” said Dr. Tom Quinn, the Director of the MIC. Dr. Quinn hopes the state-of-the-art equipment will allow the MIC to be a resource for both research faculty and students to be on the cutting edge in their fields. Dr. Ritcha Mehra-Chaudhary and Dr. Fabio Gallazzi work within the MIC and provide their expertise. Dr. Mehra-Chaudhary works with X-ray crystallography, dynamic light scattering and custom protein expression, while Dr. Gallazzi is an expert in custom peptide synthesis. Their work can be important for understanding drug design to combat viruses and cancers. The MIC started with one machine, an X-Ray Diffractometer, in room 442 of the BLSC. It took six months to collect the different machines from different departments in the campus, but in December the MIC became fully operational. The MIC team celebrated with an open house on Jan. 24, 2018. The MIC won’t only be beneficial for campus researchers, but also researchers from all over and undergrad students who are eager to learn the details of molecular interactions and learn how to use core facilities. There are many exciting and new technologies in the MIC that will interest outside researchers, according to Dr. Quinn. One of these is the nanodisc technology that Dr. Mehra-Chaudhary works with. This technology allows researchers to study membrane proteins outside of something bigger, like a cell, while also keeping them in a functional and native structural state. The nanodisc project is part of collaboration between the MIC and the Electron Microscopy Core to allow researchers to get high resolution structures of membrane proteins. While affordable, outside and campus researchers must also pay a price to use the facilities to cover consumables, instrumentation maintenance and staff. “We definitely want to at least break even. I don’t know how long it will take to get there. However, the major goal is to support the scientists on campus and facilitate their research,” Dr. Singh said. Bringing this support to campus also means supporting future scientists. Dr. Singh has three undergraduate students working with him who are learning how to use the advanced technology, and he helps to train many more from all different departments. The goal is to one day expand the MIC to a point where all molecular interactions facilities can be at one place. “There are certain techniques we don’t have, and I hope that in the future we will get them. We hope to provide all modern techniques to the university community in coming years. Not only linked to that room, we want to expand it,” Dr. Singh said. Dr. Quinn agrees, and he hopes that as researchers come and use the core. In the process the core can understand future needs and where the research is moving to see what new technology under their umbrella could be added to keep supporting the scientists. The MIC is a big step for the MU research community, and staff is hopeful that it will continue to grow and produce life-altering research. The family garden doesn’t typically turn into a life-long journey of studying plants. But when Eric Fedosejevs went to college, the native Canadian found that plants naturally made sense when deciding what to do with his life. 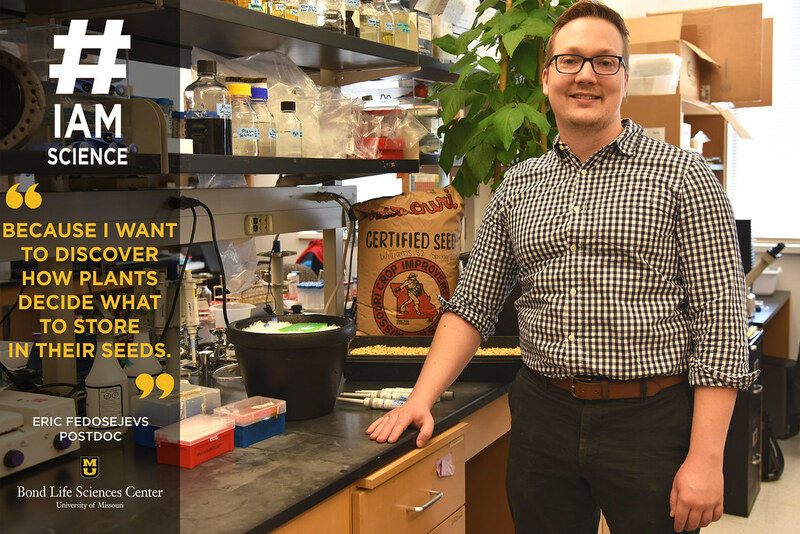 As a postdoc in Jay Thelen’s lab in Bond LSC, Fedosejevs has gone from longtime student to full-time researcher. “A major focus of the Thelen lab is to look at oil biosynthesis in developing seeds,” Fedosejevs said. Specifically, Fedosejevs works with soybean, which is a key crop in the United States because it has such a high protein content. But oil production suffers because of the high protein and his focus is looking at altering that part of the seed. In his role as a postdoc, Fedosejevs has the freedom to do what he loves with the guidance of an established researcher in Thelen. When he’s not in the lab working on soybeans, Fedosejevs can be found reading about anything that piques his interest. “I can spend a whole day reading about a topic I know nothing about,” Fedosejevs said. It is that dedication to learning that landed him in academia, and it’s also what guided him to a career as a researcher. Fedosejevs, however, believes that genuine curiosity is the foundation for being successful in science. “If you have that mindset and you find a research area you’re also passionate about, a postdoc is very much something to look forward to,” Fedosejevs said. He’s able to focus all of his energy on his work, and he loves it. Breaking things apart and putting them back together has been engrained in Patrick Nittler’s life for as long as he can remember. Growing up, Nittler served as his dad’s sidekick as he salvaged parts of a broken computer to boost performance in their new one. Moments like those were bonding experiences that encouraged the innate curiosity of the now second year molecular plant biology Ph.D. candidate. Although plants and your run of the mill computer have little in common, Nittler was inspired to follow his interest in how things work. “I’m a curious person in general, so once I started working with plants I realized it’s something I’m really interested in,” Nittler said. As part of Mannie Liscum’s lab in the Bond Life Sciences Center, Nittler works on a protein called Nonphototropic Hypocotyl 3 (NPH3) that belongs to a 33-gene member family. This protein is part of the complicated way plants respond to light and the signals that make them grow toward or away from sunlight. Doing so could help Nittler and his lab to learn more about the rest of the gene family. It could also contribute to his main area of expertise: phototropism, which is how plants perceive and respond to light sources. This can increase the efficiency of photosynthesis by orienting the leaves of the plant toward sunlight. Nittler, however, directs his attention to just part of the family. Meaning that two of the three are recognized as genes, but what happens when you mutate them is uncertain. While figuring out what mutations cause is important, Nittler has his attention elsewhere. In order to better understand the genes, Nittler is attempting to learn the 3D structures of the protein’s middle section. Even though it hasn’t worked out just yet, Nittler continues to try new things in hopes of finding the solution. There are a number of ways to get involved in research, but tennis probably doesn’t come to mind. Rohit Rao was practicing his serve alongside Kamal Singh in 2015 when the two began talking about science. The junior biology and psychology double major expressed his interest in working in research, and Singh offered for him to join Stefan Sarafianos’ lab in the Bond Life Sciences Center. 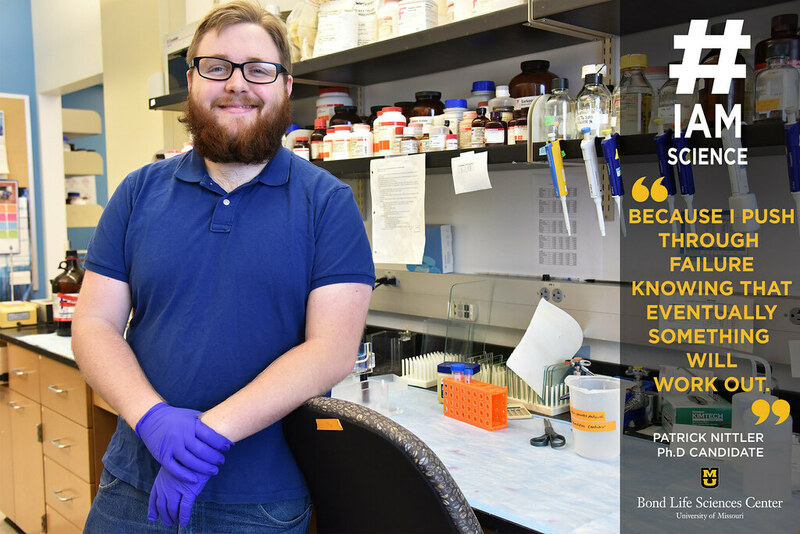 Rao understands the idea that research builds upon itself, which is why learning the basics before coming to Mizzou proved helpful. The Columbia native is following in his family’s footsteps by pursuing science. 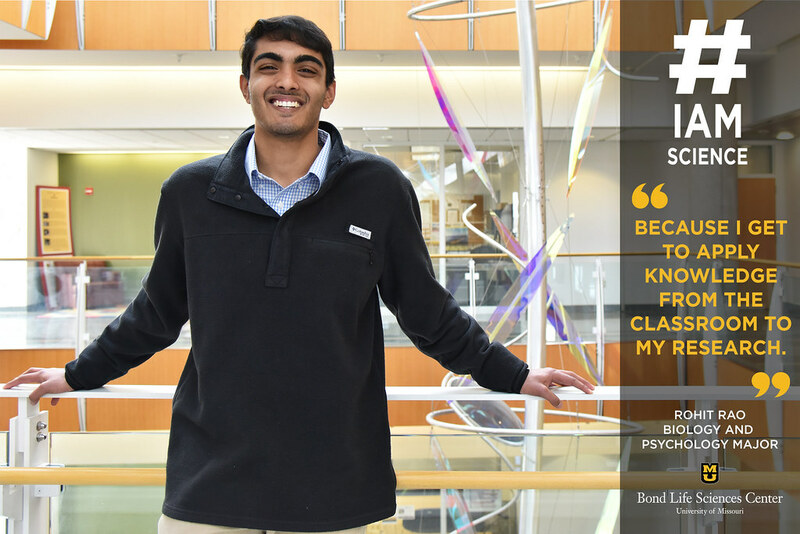 After graduating next year, Rao plans on attending medical school and applying the knowledge he’s gained from all of his experiences. Those applications have proved helpful for Rao while working with Singh. He has grown as both a scientist and a researcher since that conversation on the tennis courts years ago. Now, he works with Human Immunodeficiency Virus (HIV) and contributes to the drug development process. This process serves as the precursor to clinical trials, which ultimately leads to drugs going on the market. While the work is classified as basic research, Rao is happy to do his part.